Handmade Harbour: Free Sewing Class and Shoe Fabric! Free Sewing Class and Shoe Fabric! I know a lot of people are really getting into sewing these days. One of my daughters is teaching herself quite a lot with her new (to her, anyway) sewing machine (I'm impressed with her creative skills so far). And my 10-year-old granddaughter Keira is really excited about learning to sew. 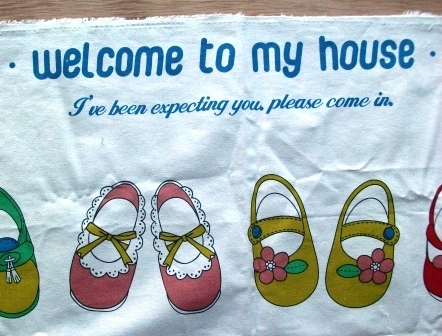 She's made lots of cushions and a snuggle bag already but wants to move on to making bags. I mention this because I just found a brilliant free video class on Craftsy that teaches you how to make a tote bag. I've downloaded the video and I'm going to get my daughter and granddaughter to watch it. Maybe they can even have a bit of auntie/niece bonding over it! 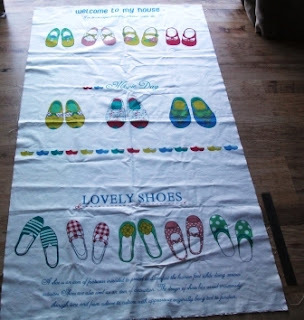 On the bag theme, Keira has plans to make a shoe bag - with a shoe print fabric (above and below) The fabric is just amazing, and one metre gets you enough to make a few bags. But I like the idea of a hanging panel too - the wording on the fabric just lends itself to something you could put on a wall! You may remember my dotty denim from this post - it's from Wholeport like the shoe print fabric. 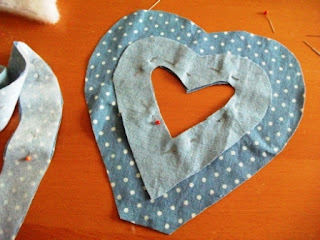 I have more plans for this denim - I want some oven mitts from it and also a cushion. Unfortunately, I did waste some of it when I got my photo frame wrong when I was experimenting with a design, so I don't have as much as I'd like. I may have to order some more, or maybe I'll back the cushion with something else. Either way, I do officially love my dotty denim! It's quite soft for a denim fabric, and I can imagine it would work for all sorts of things - including bags. 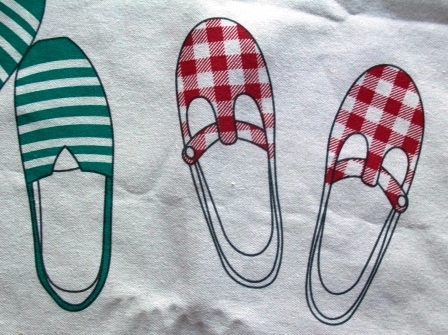 I can imagine it with a brilliant red or bright floral print lining.